This Holiday You Can Give The Gift That Can Change A Child�s Life! [12-04-2007] Big news! Amazon has reduced the price on the Robopanda from $199 to $59! Hurry, sales quantities are limited. Click here to buy now, or read more about this educational robotic toy by looking below the Robopanda picture shown here. [11-12-2007] What would you rather do this this holiday season? You could give a child a gadget that they play with for a few days and then shove into a closet, or you can get them their own little private teacher that will help build important thinking skills that will last a lifetime. 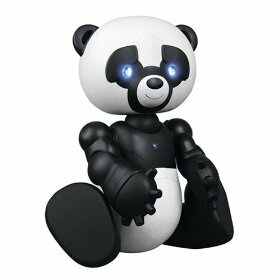 Robopanda is a small infinitely patient friend that instead of showing them how to shoot at random things in a video game, will play healthy games with them designed to boost their memory, sing songs with them, and tell interactive stories to fire their imagination and practice their concentration. WowWee has created a Robobear that bears a resemblance to the ultra smart A.I. driven bear that was in Steven Spielberg�s famous film, A.I. PC Magazine author Lance Ulanoff has just published a full review on the Robopanda. He gives the educational bear a full examination and ends up giving the Robopanda solid marks for being fun and entertaining for children. After you�ve read it, close the window and come back and watch the Robopanda video to see it in action. It does not have a remote. It responds to touch on nearly every part of its body. It encourages children to play interactive games and interactive stories to help educate the child and practice important mental tasks like memorization and more. Buy Robopanda from Amazon for only $59 while supplies last! Would you like to have your own baby dinosaur? Get the latest RS Panda robot news and tips delivered direct to your email box. Subscribe now!